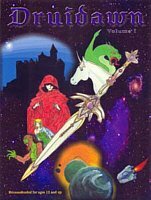 Druidawn is an anthology filled with kids writings of short stories by young authors for the enjoyment of their teen peers. It is designed for teen writers who wish to create works of art and fiction in the science fiction/fantasy genre. Hosting a writing club that meets regularly in Lafayette, CO, and an interactive website, Druidawn offers teen authors a supportive community and a revolutionary publishing opportunity. To submit a story or a work of art for future volumes of Druidawn, please first read Volume I of the Druidawn series. In the back of the book is a lengthy appendix of creatures, places, and important people you'll need to be familiar with before you step into this world. Kids writings of stories and poetry can be anywhere from 1-20 typed pages (at .12 size). Art can be black and white or full color. No pencil sketches, please. It must be inked and easy to scan. When you have completed a document or a work of art and are ready to submit it to us, please e-mail it to Miriam Darnell, the Druidawn editor. This is also where you can direct any questions you may have about your story. Your submission will be reviewed by a panel of your teen peers as well as the editors of Druidawn. Please allow 4-6 weeks for a reply. Be sure to include a self addressed stamped envelope if you want your work returned! Please note that Druidawn is geared for a PG-13 audience. Be sure that your submission is appropriate in content for that age group. Profanity and explicit violence or explicit sexual situations is prohibited. You must be 18 or under to submit work for Druidawn. Read Dragonsong, by Nate Goldstein. This is one of the many stories that were included in Druidawn.